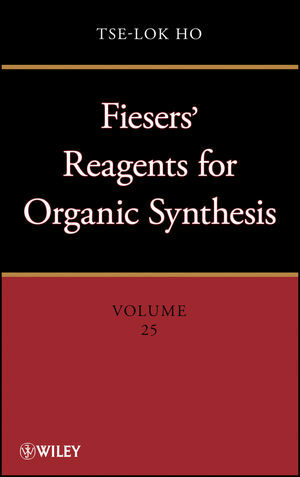 The highly successful Fieser & Fieser series has provided several generations of professional chemists and students with an timely survey of the reagent literature. Providing an up-to-date, A-to-Z listing of reagents cited in synthetic literature, Fiesers' Reagents for Organic Synthesis, Volume 27 encompasses chemical literature from the end of 2009 to the end of 2011. Listed by common name, each entry feature a concise description, illustrations of chemical reactions, selected examples of applications, how to make it or buy it, what it is good for, and where to find complete details. TSE-LOK HO is Professor of Organic Chemistry at the National Chiao Tung University in Taiwan. The author of thirty books, Dr. Ho is dedicated to research in organic synthesis, including the total synthesis of natural products and its underlying methodology. Dr. Ho holds degrees from National Taiwan University and the University of New Brunswick, Canada.